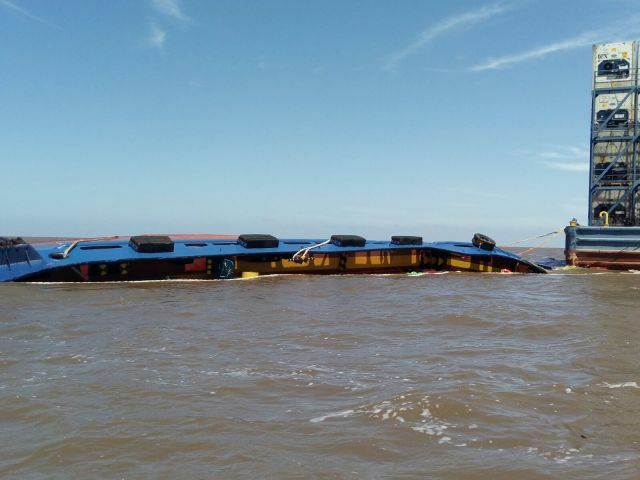 The Paraguayan tugboat GF Tacuari sank this afternoon in the river de la plata, in front of the town of Colonia, downstream of the Martin Garcia Canal. the causes are being investigated but everything indicates that the boat touched an unidentified object that caused a considerable course, where water quickly entered, causing the total sinking of the vessel. All the crew is safe thanks to the rapid action of the Uruguayan prefecture and the application of the emergency system of the ship. The GF TACUARI belongs to the company Guaran Feeder and transported containers on a barge at the time of the incident. the barge is anchored. River Of The Silver is wrong. Since it is a proper name there is no translation to it. The correct title should be Urgent: Shipwreck of the GF TACUARI in the Rio de la Plata, Uruguay.